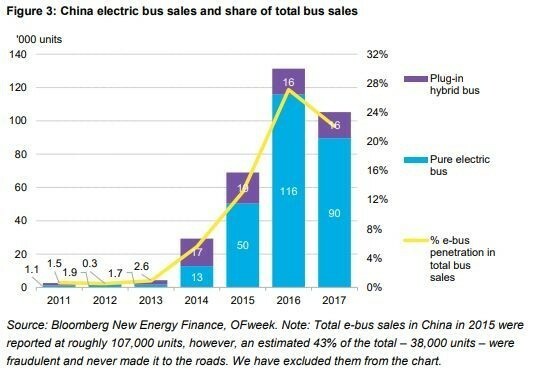 China is the world's pioneer in full scale adoption of electric busses. Every five weeks, 9,500 brand new electric buses take to the roads in China. That’s the equivalent of the entire London bus fleet, says a new report by Bloomberg New Energy Finance. The world has around 3 million buses. Most run on diesel and compressed natural gas. The global fleet of electric buses now totals around 385,000 vehicles - and 99% of those are in China. China has the biggest urban population in the world and air pollution is a major health hazard in Chinese cities. It’s also a high-profile political issue, says the report, so authorities must be seen to be doing everything in their power to clean up city air. On a broader economic level, China also wants to reduce its dependency on oil. Strict air quality targets are driving the demand for electric buses. The government is subsidizing operators in the purchase and deployment of new fleets of environmentally friendly public transport fleets. Until the end of 2016, national and regional subsidies combined to bring the initial capital cost of an e-bus to below that of a similar diesel bus. Many cities in China are new, which means the infrastructure required for electric buses can be built into the general transport infrastructure plan from the outset. In more established cities, officials have to work out how to assimilate the technology needed. Some major cities, like Shanghai and Shenzhen, have stopped buying traditional fuel-run buses altogether and are only buying electric. China has ambitions to be a major exporter of electric buses. It already builds more than any other country and will look to open up new markets as cities around the world introduce policies geared towards cutting vehicle emissions and improving air quality. Europe and the US have a long way to go to catch up with China. 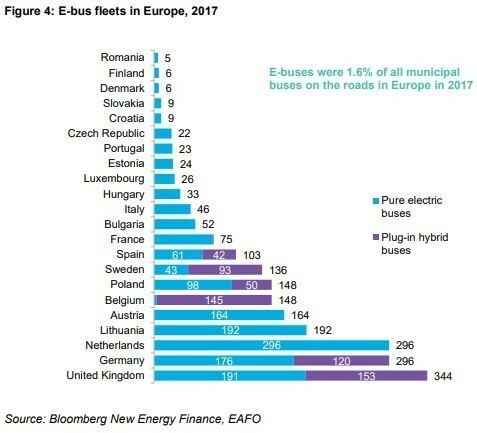 Only 1.6% of all city buses in Europe are electric. In the US, it’s only about 0.5%. However, the global e-bus market is changing. Transport is responsible for around 23% of energy-related carbon dioxide emissions globally. Electric vehicles - which have zero emissions - are widely seen to be the solution. In addition, falling battery prices are making electric buses more economically attractive. In October 2017, 13 cities, including Paris, Vancouver, Mexico City and Cape Town, signed the C40 Fossil-Fuel-Free Streets Declaration, pledging to buy only zero-emission buses from 2025. One of the major barriers to cities opting to use electric buses is that they are much more expensive to own and operate than conventional diesel or natural gas buses. They represent a big upfront cost to city budgets. 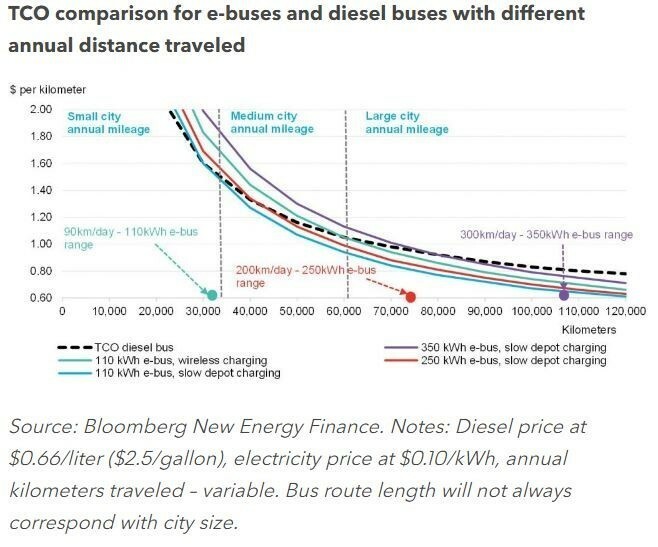 However, analysis by Bloomberg concludes that e-buses have much lower operating costs and are already cheaper, on the basis of total cost of ownership, than conventional buses today. Currently, batteries represent about one-quarter of the bus price, but the report says that the cost of batteries will reduce to around 8% of the total in the next few years. There is no doubt that e-buses will help cities to breathe more easily but the expansion of the e-vehicle industry is producing new challenges. Mining for cobalt, essential for the batteries that power electric vehicles, can be a polluting and hazardous process. There are also widespread reports of child labour in the cobalt mining industry. In addition, electrically charging millions of vehicles will increase the demand for energy so that the end-to-end process of running e-buses will require more power from clean, renewable sources. However, many cities - including the signatories for the C40 Fossil-Fuel-Free Streets Declaration - are looking at electric buses as part of a wider solution. They also want to take more vehicles off the road altogether, and encourage much more active modes of getting around such as walking and cycling. “We envision a future where walking, cycling, and shared transport are how the majority of citizens move around our cities,” they say.